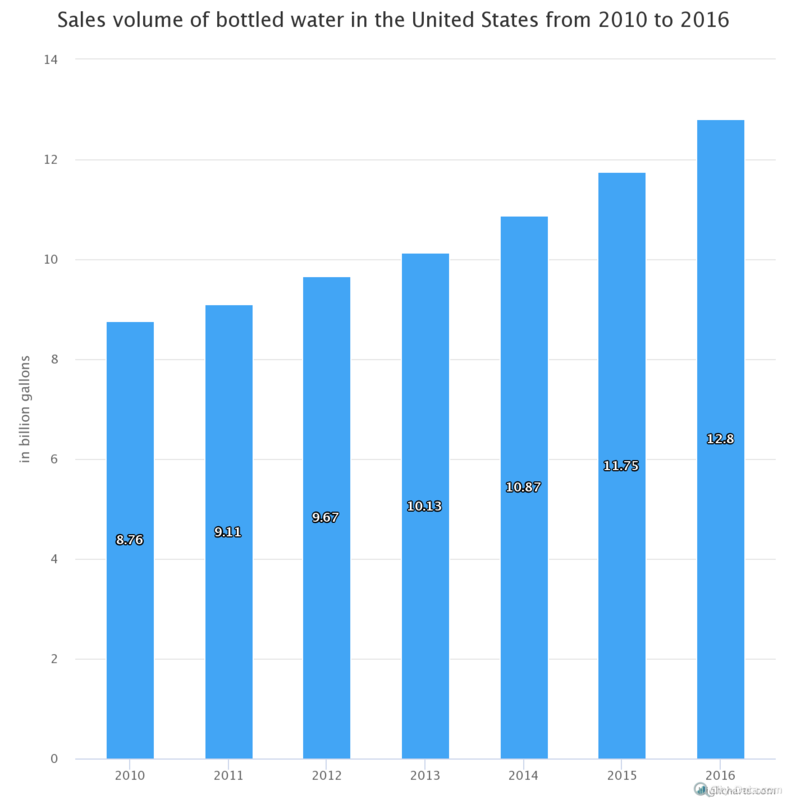 The graph below displays the sales volume of bottled water in the United States from 2010 to 2016. As you can see, a total of 8.76 billion gallons of bottled water were sold in the U.S. in 2010. One year later, the volume of bottled water sold in the country amounted to 9.11 billion gallons. In 2012 and 2013, Americans purchased 9.67 billion gallons and 10.13 billion gallons of bottled water respectively. Sales of bottled water reached 10.87 billion gallons in 2014. In 2015, the sales volume increased to 11.75 billion gallons; this upward trend continued through 2016, when American consumers purchased approximately 12.8 billion gallons of bottled water. Bottled sparkling water is a subcategory of bottled water. Bottled sparkling water comes packaged in glass or plastic water bottles and is fortified with carbon dioxide. 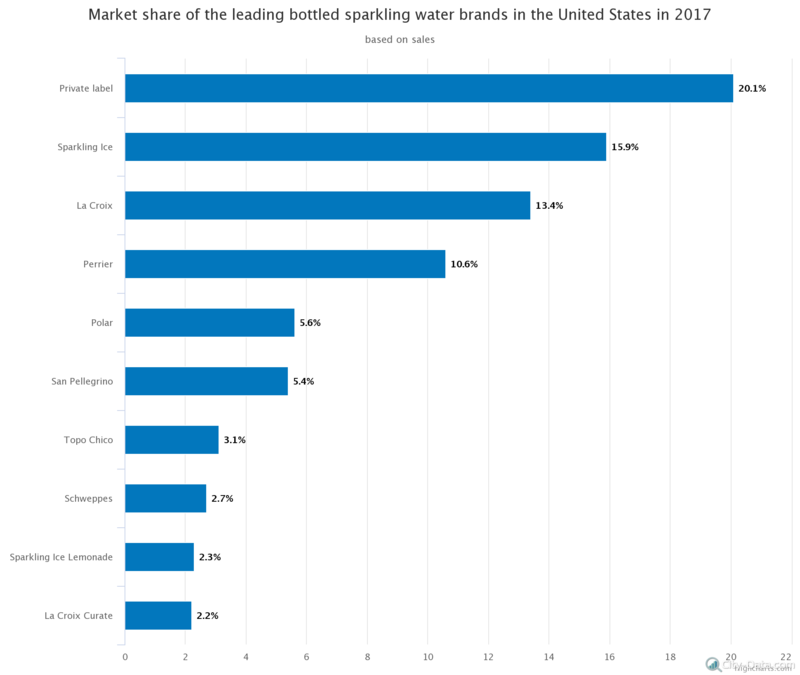 IRI and Beverage Industry Magazine provided some current information about the leading bottled sparkling water brands in the United States and their market share in 2017 — that year, bottled sparkling water generated $482.87 million in sales. During the 52 weeks ending August 13, 2017, private label brands of sparkling water sold more than any other brands, taking more than 20 percent of the overall market share in the U.S.
Sparkling Ice brand finished second, capturing a 15.9 percent market share. The third largest brand by market share was La Croix — this company held a market share of approximately 13.4 percent in the U.S. The famously-known brand Perrier took fourth with a 10.6 percent share of the U.S. bottled sparkling water market. Polar brand sparkling water rounded out the top five with a market share of 5.6 percent, while San Pellegrino followed closely with a 5.4 percent market share. Previous PostDeaths from influenza and pneumonia in the U.S.Next PostBeef production in the U.S.